In our special series re-visiting great Hindi film classics, we look back at Rajesh Khanna and Sharmila Tagore starrer Amar Prem (1972). Every time I pass the Bandra-Mahim junction of Mumbai, I notice an enormous sculpture bearing a plaque that reads the above. This is the plain proclamation that comes to mind after I revisited Shakti Samanta's Amar Prem starring Sharmila Tagore, Rajesh Khanna and Vinod Mehra, which celebrates the dynamics of a mother-child relationship built on the basis of unconditional, spontaneous affection independent of blood or biology. Tagore plays Pushpa, a village girl thrown out of her house by her husband, his second wife and, subsequently, her own mother who prefers to believe obnoxious neighbours over her own daughter. At the verge of committing suicide, she is deceived into taking up prostitution in Kolkata. But Samanta is careful in his depiction of the same. He doesn't go into detail to document her betrayal nor gives out graphic descriptions to establish her murky new life. Instead, the extremity of her sufferings hasn't hampered the soft-spoken Pushpa's innocence or virtue. It's the 1970s, after all. And Pushpa is prone to judgement if not epitomised as the proverbial lotus rising above muddy waters. Only two people empathise with the story enveloping Pushpa's smile and silence. Anand Babu (a devastatingly handsome Rajesh Khanna), a frequent visitor, recognises and revers the 'Meera' in her voice and selflessness in her temperament. Cloaking his despondency and cynicism in wine and wit, the ever-smiling Anand Babu, in a singular dark moment, pulls the veil off his facade of a marriage. A pair of teacups, an ashtray overflowing with burnt cigarette butts, a house screaming for the attention of its mistress hints at a case of infidelity. But nothing is said out aloud in Amar Prem, the grim aspects of its story are implied, never investigated. The other is Nandu (Bobby), the school-going son of Puspa's fellow villager (Sujit Kumar) and his cantankerous second wife (Bindu). Mistreated by his stepmom, Nandu finds comfort and piping hot samosas with Pushpa. Ever so pampering and kind, the latter relishes in her unplanned role of a stand-in mom considering her husband discarded her, earlier on in the film, citing infertility. Shakti Samanta's style of filmmaking doesn't believe in understated storytelling. He would rather go with time and tested stereotypes. Yet the essence of Amar Prem is far too profound and radiant to be overridden by this surfeit of hostility. The heft and soul brought in by his intuitive actors, Ramesh Pant's memorable dialogues, Rahul Dev Burman's resplendent score and Anand Bakshi’s inspiring lyrics weave the chapters, which unravel over a period of time -- right from Pushpa's rude rejection in the village, her arrival in Kolkata brothel, her closeness to Anand Babu and motherly sentiments towards Nandu to a life of misery and obscurity till she's rediscovered by her 'family' in a poetic reunion after a lifetime of ordeals. A remake of Aravinda Mukherjee's black-and-white Bangla film Nishi Padma, featuring Uttam Kumar and Sabitri Chatterjee, which itself is based on the acclaimed author Bibhutibhushan Bandopadhya's short story, Hinger Kochuri, Amar Prem appears lavish, if also maudlin, in comparison. Having said that, those who haven't seen the original, the making of a picture perfect family from broken, victimised and dejected members of other, Amar Prem offers a poignant payoff. Its only comic interludes engage a drunk Om Prakash. Long before vodka pani puris began trending upmarket restaurant menus, the veteran wolfs down an entire hamper of pani puris filled with alcohol. Would you believe the willowy Sharmila Tagore of Amar Prem had delivered Saif Ali Khan only a couple of years before its release? Though her Pushpa occasionally resembles the weepy Vandana of Aradhana, helmed by the same team, the actress doesn't speak too many lines. Her performance primarily relies on her large, expressive, kohl-lined eyes to connect with the viewer. Even the simplest cotton sari cannot conceal her intrinsic charisma and stardom but when she's around the loveable child star Bobby, the actresses exudes delightful accessibility, her body language is the one we all recognise -- a mother's. It can be obvious in something as simple as the manner in which she runs her fingers in the kid's hair or cuddles Nandu close. And all her fashion statements -- in what would go on to known as the Amar Prem blouses, a huge rage back then -- cannot distract us from the beauty of this Yashoda-Kanhaiya bond sweetly demonstrated in Lata Mangeshkar's lilting rendition of Bada Natkhat Hai Re Krishan Kanhaiya. Ka Kare Yashoda Maiya? 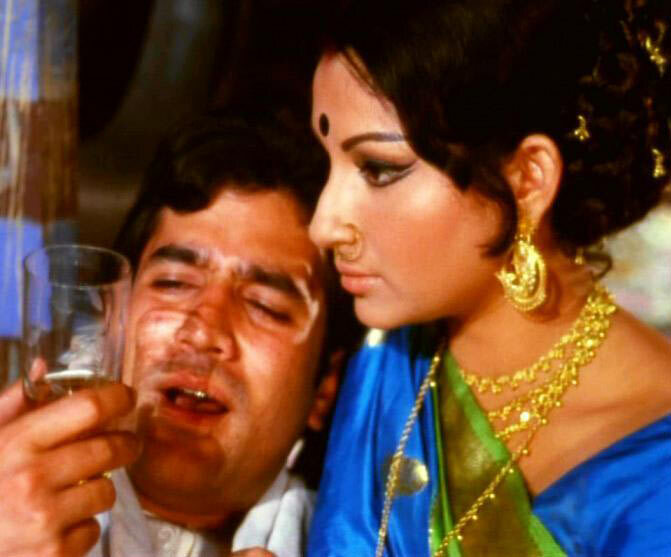 Playing the other significant relationship in her life, Rajesh Khanna is what binds the narrative together. Not only is his genial, elevating friendship crucial to Pushpa and her aspiration to assist Nandu when he falls sick but also to the film per se. Amar Prem isn't a potboiler where heroics involve mouthing threats and smashing the bad guy's skull. Physical intimacy doesn't define their equation, absence of commitment does. Neither demands anything from the other, there's never a need to define what they share. In an ideal world, they'd make for a textbook marriage. In Samanta's universe, they're wounded souls who refuse to feel embittered. Rajesh Khanna, a huge admirer of Uttam Kumar, watched the original a number of times to embody the blithe spirit of Anand Babu. Both the Bengali acting legend as well as the audience approved of his performance and that iconic dialogue concerning saline water, "Aansoo paunch daalo Pushpa, I hate tears." Every single melody of Amar Prem is an eternal gem and rubbishes any criticism levelled at RD as a peddler of 'westernised' tunes. Truth be told, it's what makes the Amar in its title hold true. In an interview to Filmfare magazine, Pancham acknowledged the impact of the soundtrack success on a professional as well as personal level. His father Sachin Dev Burman had never been more proud. Interestingly, the legendary composer also sang the heart-breaking Doli Mein Bithai Ke, which plays against the opening credits of Amar Prem. Its songs are a constant on my playlist and philosophy. There's indescribable comfort in Kishore Kumar's soothing argument, Kuch Toh Log Kahenge. Logon Ka Kaam Hai Kehna or his equally fabulous Hindi rendition of Yeh Kya Hua, previously recorded as Ae Ki Holo on RD's tunes for Bengali film, Rajkumari. And many nights have been spent drowned in the melancholy of Lata Mangeshkar's awe-inspiringly sublime Raina Beeti Jaaye. And then there's The One. Amar Prem is synonymous with the gentle, sensual imagery of Chingari Koi Bhadke. The signature guitar, late-night sail on the Ganges, Sharmila Tagore draped in a rich blue-green benarasi with traditional gold jewellery, Rajesh Khanna in his crisp dhoti-kurta combo and Kishore Kumar's magical voice serenading the air (Natraj Studios, actually) with Anand Bakshi's wry words, romance and heartbreak were never this simultaneous. It pains me to think how robbed RD and Bakshi must've felt at the Filmfare awards that year when Manoj Kumar's populist Be-Imaan enjoyed a clean sweep (Amar Prem won for dialogues, screenplay and sound). It would be another decade before RD got his due with a Best Music trophy for Sanam Teri Kasam. But as the wise man on the album wrote, "Hum kyon shikwa karein jhootha? Kya hua jo dil toota?" Vinod Mehra only appears in the last few reels. Usually it's discomforting to warm up to a grown-up version of a character played by a likeable kid for a bulk of a movie but Mehra's earnestness makes for a credible Nandu. Perhaps in the age of self-seeking, Nandu's deep-rooted love may seem a tad far-fetched but if Mohan Bhargav's fondness for Kaveri-Amma in Swades worked, Amar Prem isn't quite off the mark. 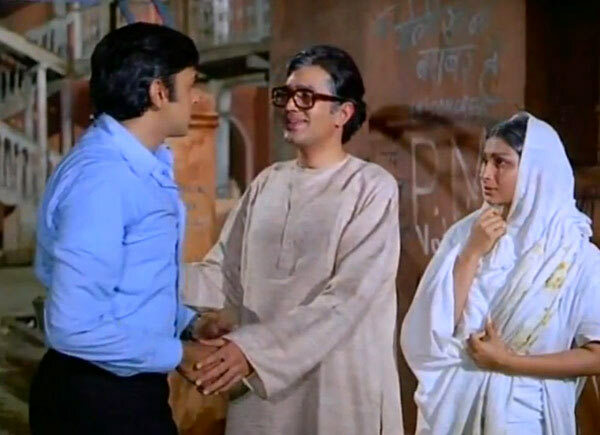 Amar Prem ends with a happy reunion, a tearful goodbye and the symbolic imagery of Durga Maa's idol receiving a warm welcome in the abode of her devotees. From addressing her as 'Woh' to acknowledging her as 'Ma,' their relationship has bloomed just like the young raat ki rani (Cestrum) sapling Nandu planted in Puspa's garden exactly as Anand Babu had predicted, "Bahut, bahut, bahut phool khilenge."